This is the last installment of our 3-part series on floor displays. As we have been discussing, floor displays can be great vehicles for generating sales lift because they automatically create separation from the on-shelf competition by virtue of the fact that they are stand-alone. So far, we have reviewed 20 floor displays that can be used for effective merchandising. If you missed it, you can check them out in Part I and Part II of this series. Let’s take a look at our final 10 examples. 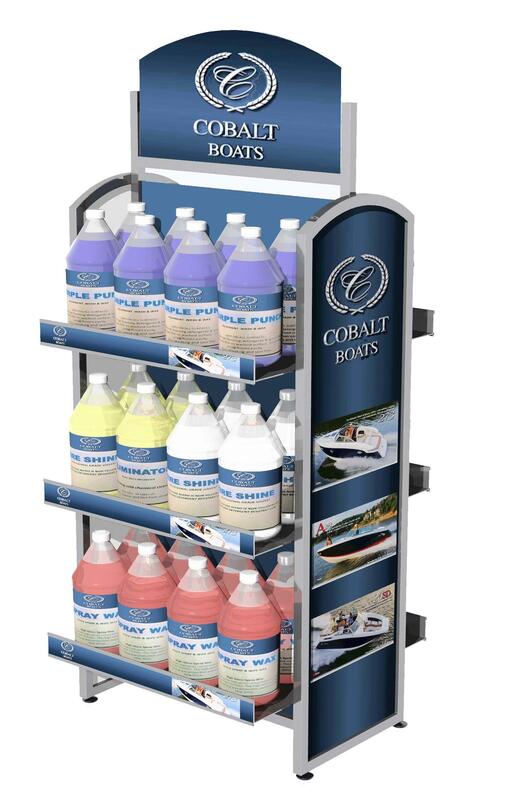 Our first example is a 2-sided merchandiser that we designed for a company that makes boat care products. Since their products are liquid and sold in large plastic containers, we had to design a floor display that could bear the weight over time. At the same time, our customer wanted an effective, heavily-branded presentation that would catch the attention of boat owners in retail boat stores and marinas. We went with a metal tube frame with a curved top on the sides to match the die-cut header sign shape. To make it more upscale (and strong), we used sheet metal shelves with generous shelf lips for shelf branding. We added a solid PVC center panel and side signs. Our second example is a 2-sided floor display we designed for Brave Soldier’s line of antiseptic skincare products. It has a similar metal tube structure as the display shown above but is entirely different. Since the products are lightweight and the customer wanted a mobile merchandiser, we put this one on wheels and designed it with 5 sheet metal shelves with screen-printed shelf branding. We added a side glorifier shelf and die-cut side and header PVC signs. This display has a really small footprint and is very cost-effective. 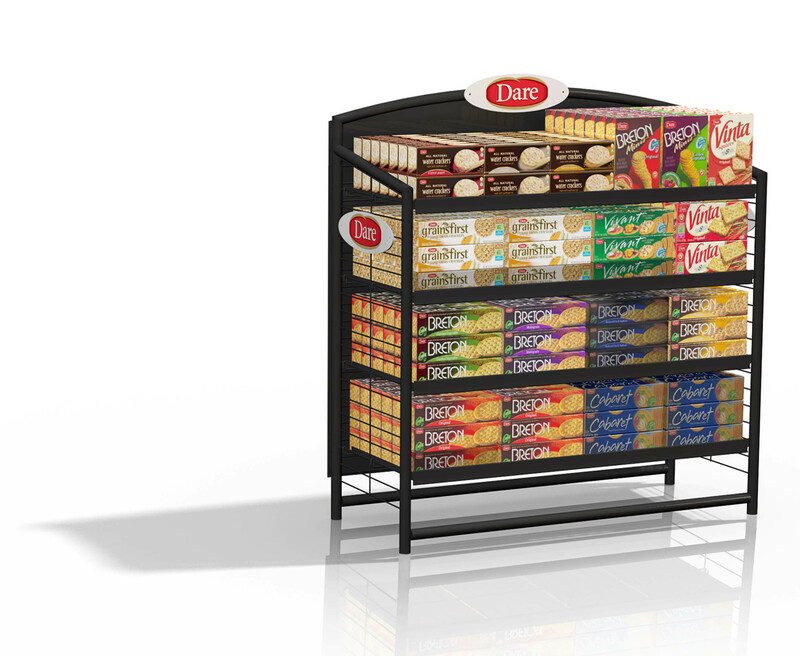 Third, we designed the endcap merchandiser shown below for Dare Foods, a Canada-based manufacturer of cookies, crackers, fine breads, and candy. As far as end-cap floor displays go, this one was very cost effective. We used a metal tube frame with wire sides and back, 4 metal shelves with a sheet metal lip, a solid black PVC back panel and die-cut PVC header and side signs. The display was designed to be knock-down which made it relatively cost-effective to ship given its size. The fourth example shown below is display we made for diecast toy cars. We used a metal tube frame and curved metal tube uprights to simulate a curved road with the PVC road graphic we added. We used wire shelves with clear plastic inserts to keep the cost down, and added the header stop sign to get shoppers to stop and take a look at the cars. The small footprint makes it possible to use this display in convenience stores and a wide range of retail environments. It would be easy to adapt this display for lots of different products. We made the endcap shown below for grab-and-go food items in a convenience store. It’s really basic, and there isn’t anything new here, but we chose to include it as an example because it is so universal. This knock-down design has MDF shelves with a wood melamine finish and black powder coated metal trim. The header and side PVC signs can easily be changed out to create a whole new look. Our sixth example is a 2-sided mobile floor display we designed for Paver Tool Innovators to showcase their line of time saving tools. We tried to create an interesting shape for the metal tube structure and utilized wire side and center grid panels both for strength, cost, and functionality. We used sheet metal shelves with branded shelf lips and then used hang bars and hooks on the sides along with sheet metal bins for bulk tools. We included a removable header and a secondary graphic below the small upper shelf. So far, we have covered a lot of metal floor displays so for our seventh example, let’s look at a wood floor display. 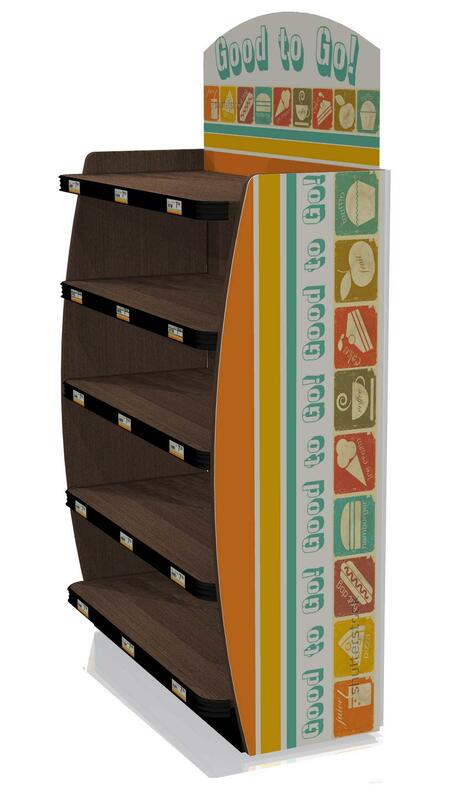 This is a 1-sided, 4-shelf unit we designed for Soapbox to merchandise boxed product and dispenser bottles. We used solid pine construction and added a grey/brown wash finish. We screen printed graphics on the oval header and sides. This is a great natural look for any personal care product. Our next floor display shown below is a good example of how you can start with a basic metal tube and wire display and dress it up with a little higher budget. We created this display with 3 wire shelves with shelf lip branding. We used removable single peg hooks on the sides for hanging product. We added a heat-bent, digitally printed PVC base cover to help promote the Lexol brand and make the display more upscale. We finished the display with a circular header sign attached to a removable metal sign holder. This type of display is cost-effective, extremely functional, and versatile enough to use for a wide range of products. Our ninth example is the Torco oil and fuels display shown below. This is another very straight-forward display that can be used for automotive or other types of products typically merchandised on shelves. It has a knock-down metal base and 4 removable sheet metal shelves with a screen printed oval branding plate on each shelf. We incorporated side signs and added a PVC header sign. This display uses a minimal amount of material and puts the focus on the product rather than the display. 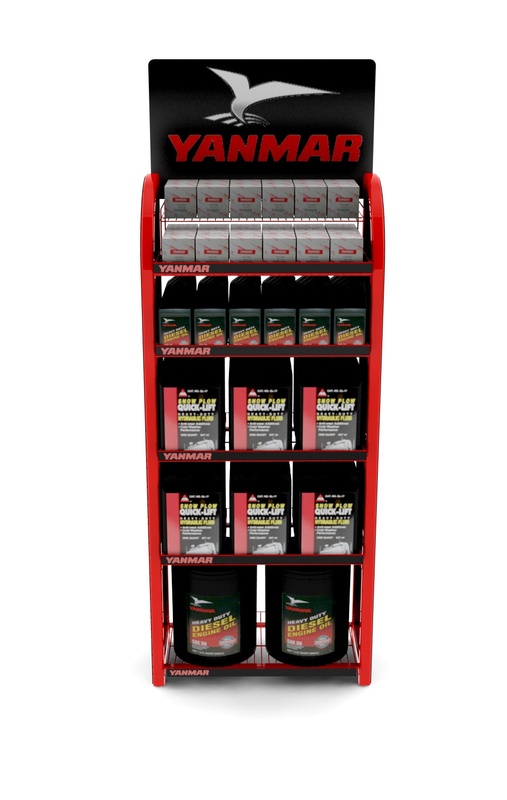 Wrapping up our series on floor displays is the Yanmar display shown below which is also designed to merchandise automotive products. It features a metal tube display with a curved top and custom red powder coating. 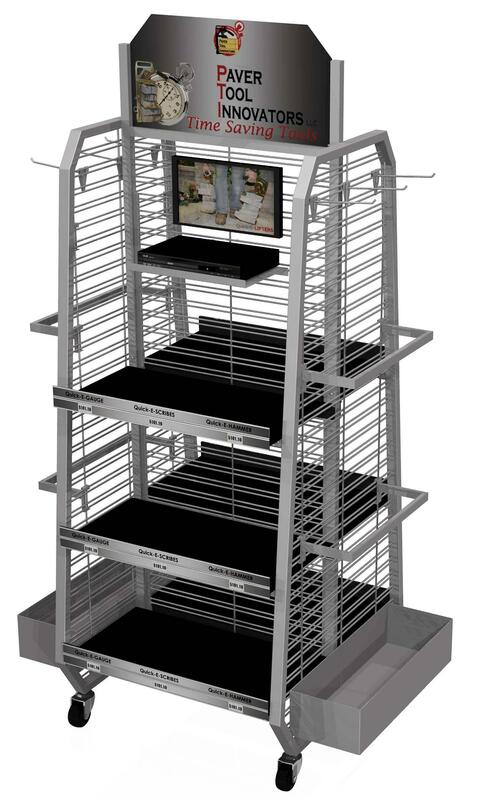 The display has 4 flat wire shelves with shelf branding and a top 2-tiered wire shelf for smaller boxed product. The side signs and header sign are designed to promote the Yanmar brand and give the display a finished look. We hope you have enjoyed this series on floor displays. We are obviously big fans of using floor displays to increase your retail presence, promote your brand, and most importantly, drive product sales.